These fresh, simple tostadas make a great appetizer for large gatherings. Add some extra filling, and you’ll also have an easy weeknight meal. 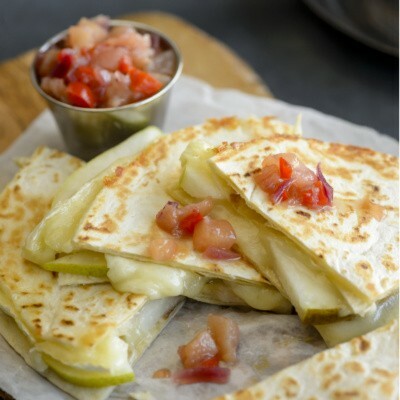 The warmed tortillas and fresh pears add the perfect balance of crunch and crisp. Heat water to boiling in a saucepan. Add the pork meat with the onion and the garlic clove; season with salt and pepper. While the meat is cooking, mix the dressing ingredients. Add salt and pepper to taste and set aside. Add a little oil to a frying pan and brown the tortillas until they are golden and crisp. When the pork is cooked, shred meat and mix with grated carrots, red onion, and chives; mix well and season with additional salt and pepper to your taste. Slice the pears and set them aside. 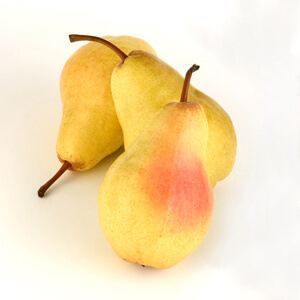 Bathe the pears in a light lemon and water solution to prevent browning. Place one tortilla on each serving plate; add ½ cup cheese and a spoonful of meat. Top with a second tortilla, lettuce, and pear slices. Pour dressing over top or serve with dressing on the side.